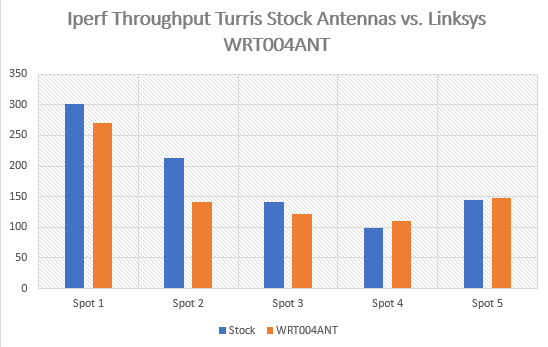 I read good things about the Linksys WRT004ANT antennas on this forum, so I replaced the three stock antennas with those. Everything else is the same. The result is rather disappointing or pretty much as expected: Worse on short distance, only slightly better for rooms further away. I defined 5 measurement spots in my 3 room apartment and run a series of iperf tests using my S6 Edge as client on the 5Ghz Wifi. The averaged values are below. At least for me it hardly makes much sense to invest money in these. That being said, I need some additional antennas to complement the stock antennas, as I want 5 in total. Any suggestion for something that is close to the Omnia stock antennas? Thank you for your measurements, they are much appreciated and informative! Thank you for your hard work and sacrifice! These were on my list to investigate some day, now I won’t bother.